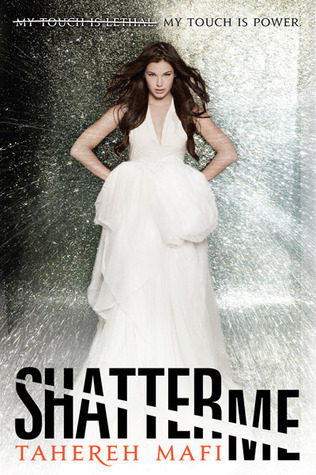 Finished Shatter Me by Tahereh Mafi a few hours before my duty started. And I have to say it’s one of those books that I could not put down. I enjoyed reading every bit of it. I loved the characters. I loved the way it was written. I simply loved everything about it. Anyway, the main characters of the story are Juliette and Adam. The story starts of almost a year after Juliette was locked up in an asylum because of her power. I won’t say what it is because I don’t want to spoil anyone. I am so not a SPOILER! haha. Anyway, I loved Juliette from the very start. I loved the way she developed into a strong person. Truth be told, I think she’s actually a very strong person even if all she did during the first part was succumb to her fears. Well, actually she did it to protect herself and everyone around her. I think she’s such a good person it simply makes it too hard for me to hate her. I think she represents everything that’s good in this planet and I simply love her for that. But, but, but I am so jealous of her at the same time. haha. You’re asking me why? Why, indeed? Simple answer: ADAM! haha. Man, that guy is just so hot. I love Adam. I think he’s one of those characters that you just can’t hate. Loyal, kind -hearted, strong, good looking, hot, hot, hot and did I mention hot? Anyhoo, I think Adam was essential in making Juliette stronger than she already is. And I love him for being there for Juliette after all that she’s been through. I just love Adam. I love loyal men. I think it’s very difficult to find one these days. haha. Then there’s Warner, the antagonist of the story. It actually came to a point that I got attracted to this guy but seriously, when you think about it he’s actually creepy. haha. I mean yeah, he’s good looking and all but he’s just a little bit creepy for my taste. But still, I honestly can’t wait to read more about him in the next novel. Overall, I enjoyed reading this book. I honestly couldn’t put it down. The pacing of the story is actually very good. Not too fast and not too slow. I loved every minute of it. It’s a work of art for me. There was never any dull moments and I just can’t wait to get my hands on the next novel. The story is not just about super powers, teen angst whatever. It’s about acceptance and finding your place in the world. I’d give this a 5/5 star rating. I wouldn’t mind re-reading it again and again. i loved this book also. stupid work kept interrupting me from finishing it but i did and man did i love it!